How hard can it be to make yellow colored food. All you need to do is add some saffron. Or use a pinch of turmeric the way I do every day for Indian curries. There's also corn and bell peppers and what not. And yet, every time I thought of making something for this month's Food in Color, imagination failed me. So I stopped thinking food and started thinking drinks. I also remembered my long forgotten wish to see what happens if I pop pineapple into the oven with some sugar. All of which becomes Caramalized Pineapple Smoothie. I buy my pineapple already peeled and cut into slices, so I arranged 3 thick slices on a baking sheet and sprinkled enough sugar to coat the fruit. Heat the oven to 250C and bake the pineapple on top rack until the sugar melts and the slices brown a bit. Let cool, then blend with 1/2 cup chilled pineapple juice and 1/2 tsp lemon juice. This Book Makes Me Cook is reading a chocoholic's dream this month. Our book club's pick was Roald Dahl's Charlie and the Chocolate Factory - a fantasy story of young Charlie Bucket who wins a trip to Willy Wonka's extraordinary chocolate factory. Willy Wonka, the factory's owner, is quite a character and equally fabulous is the dream world that he has built. I'm sure Dahl had concealed lots of morals in the book - what with all the other children who accompany Charlie on this trip falling prey to one of their faults and Charlie, the virtuous one, winning the factory as a grand prize. But what always fascinates me is the world Willy Wonka created inside this factory - chocolate rivers, Oompa-Loompas and that most amazing glass elevator that moves all-ways. Today marks the day of my arrival in this world, never mind how many years ago. While most of my celebrating is done outside my home and kitchen, I made this little dessert last night to start my birthday in style. To make Coffee Panacotta, heat 1/2 cup cream in a small saucepan with 1/2 tbsp sugar and a few drops of vanilla essense. Let it come to a simmer, but turn off the heat before it boils over. Find another bowl that would fit over one of your saucepans and put 1/3 tsp gelatine in it. Mix 1/2 tsp instant coffee with 2 tbsp water and pour it on the gelatine. Let it wait 5 minutes. In the meantime, heat some water in the saucepan and turn down the heat so it simmers. Put the bowl with gelatine on simmering water and stir until the gelatine dissolves. There is a story behind this sandwich. After being told a few hundred times that they are full and can't give me a reservation, I've given up on trying to eat at Moshe's. Then, last weekend, it was one of those rare occasions when I went downtown. And inside Kala Ghoda's Fab India store, there was Moshe's cafe. It was small and quaint, with Moshe's trademark sandwiches, salads and by now famous blueberry cheesecake. I had a bit of this and that, but there's more. For along the walls of this cafe, there were shelves of breads and dips and what not - everything, they told me, I could take home. So I brought home lavash and bagels and hummus and that's how this sandwich began. I've brought home the first plant of my "grow own herbs" project. No prizes for guessing this one. Holy Basil or Tulsi, grown in almost every Hindu household, was the easiest to find and buy. It's also one herb I'm always borrowing from my neighbour, so this one makes it easier for me to make my basil tea. Watch out for next one...I'm still debating between a big pot of mint and something a little bit more exotic. It's a bite sized cookie, with flavors of a pie, shape of a croissant and a pretty, pretty name. It's Rugelach. I first heard of this cookie when it became the baking pick for Tuesdays with Dorrie a couple of months back. The looks, the concept - everything was fascinating. And I've dreamed of making this cookie ever since. I ditched hundreds of recipes floating around and went straight to the master. It's Dorie Greenspan's recipe that I used, and ain't I glad I got it so perfect the very first time. If you look for variety in the fruits you eat, you would have seen them all. The all-pervasive, available round the year ones like apples. And the seasonal ones like strawberries and sitaphal that pop in for a few days each year. Then there are some that are neither grown nor exported to India so you don't even expect to ever see blueberries on your store shelves. And then there is one fruit grown right here but so elusive that buying it every single time feels like an adventure or a stroke of luck. I am talking of mulberries. In Delhi winter, you sometimes spot an old woman selling mulberries by the roadside. You might even get a choice between the dainty green and the juicy red berries if you are lucky. But nothing of that sort happens in warmer Mumbai. And because they are so delicate and have such a short shelf life, no one thinks of shipping them your way even when they grow as close to the city as Mahabaleshwar. I know what you see up there is a naan. But let's pretend for a moment we are making bread. For I had bookmarked this recipe for potato bread a zillion years ago. And that's what I set to make. Chopped and boiled 100 gms potatoes until they are soft. Mashed them along with 3/4 cup of water they were boiled in. While the potatoes were boiling, I added a tsp of sugar to 1/4 cup warm water, then sprinkled a tsp of yeast and let it proof for 10 minutes. To the potato/water mix, I added a cup each of whole wheat flour and plain flour, 1/2 tsp salt as well as the yeast. Once everything was mixed well, I put the dough on a flour-dusted surface and kneaded it for 10 minutes or so. It was a fairly wet dough, but got it to get smooth. Oiled a large bowl and put the dough in it to rise to double it's size. At least a few years before I entered the world of blogging, I hit upon a food blog that awed me. 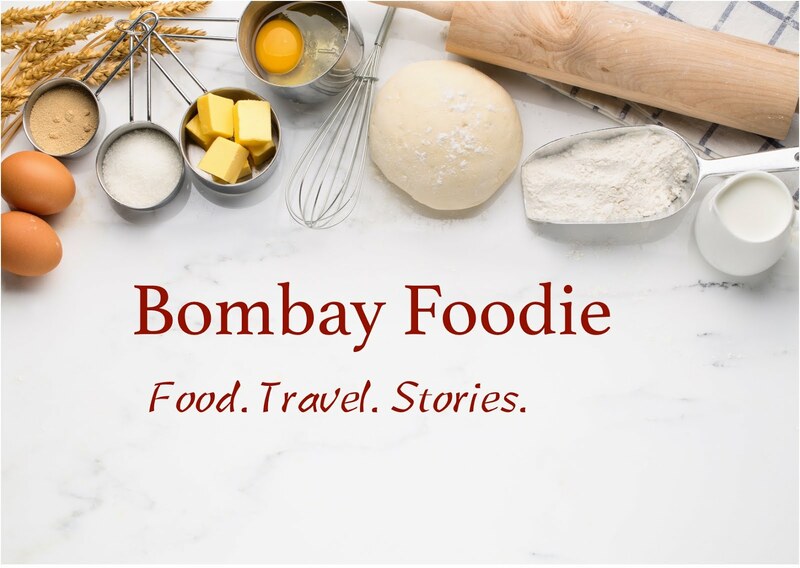 It was my first experience with food bloggers, that community of foodies that zealously cooks, photographs and recounts food experiences. This first blog led to a second one that was even more inspiring. Even after surfing countless blogs, and getting the courage to set up my own, these two blogs remain precious; a source of inspiration. The first was Clotide's Chocolate & Zucchini. The second, 101 cookbooks, Heidi's eclectic collection of vegetarian recipes. I've read every one of Heidi's recipes, but this is the first time I made something from her blog. Sushi bowl - all flavors of sushi, but no rolling - now how cool is that? Now that we have nursed our collective hangovers and (most likely) broken the resolutions, the new year can start with a bang. 2009 kicks off at Bombay Foodie with the very healthy breakfast of Bircher Muesli. A swiss creation, bircher is a one stop shop with oats, nuts, fruits all rolled into yogurt. Traditionally, uncooked rolled oats get soaked overnight in juice, and are then mixed with nuts and grated apples plus anything else you like but we take a slight departure from convention here.